Had a mini-holiday visit with my dear sister Gail who blogs at This Green Life. She has a Silhouette Cameo, something I have been wanting to try for making word stencils. We went thrifting for a few hours and Gail picked up a green tin plant holder. What could be better to use after making a stencil. 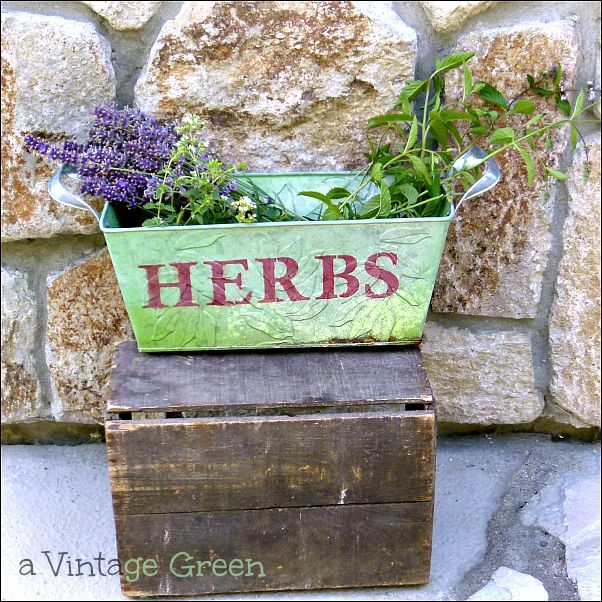 Below is the finished stenciled, enriched with herbs and lavender from Gail's garden, plant holder, the background is Gail's front entry. We played around and learned how to MAKE a stencil using the Cameo Silhouette. The Cameo is a very neat printer. The software that comes with the printer feels a bit like using MS Word. The 'art' symbols are like most drawing/art software. Several wonderful, sometimes frustrating problem solving hours later including some serious frustration because the vinyl would NOT cut the stencil (and it HAD cut vinyl - I saw the stencil Gail made some time ago), the basics of using a Cameo and its software were mostly figured out. Learned that the 'eraser' cuts needed for the stencil cut-printing NEED to be perpendicular and in line with each cut into any one letter. Think of the stencils you might have used in art class in high school (if you remember we may be close in age). Learned about join lines, sizing, spacing letters, font choice. Cut-printed just fine on card stock. Gail and I followed the usual 'adding a stenciled word to an object' sequence to test the stencil. Place on surface to be stenciled, tape to hold, use a sponge (or a stencil brush), dab the paint on the sponge and then use newspaper (or a rag) to DAB the paint OFF the sponge until it is fairly dry. Dab the sponge (or stencil brush) on the letter, repeat until finished and carefully remove the stencil. 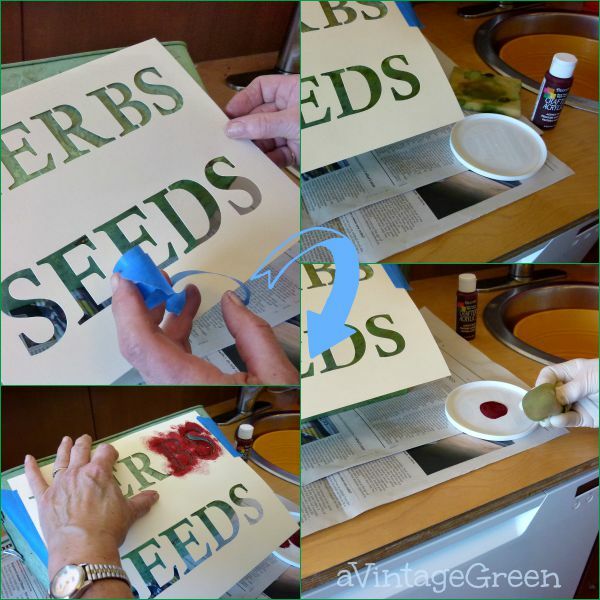 If the sponge/brush is too damp the paint will run under the stenciled letter edges. Any runs can be cleaned up (if using a water based paint) with any of the following: a q-tip, a dampened small pointed paint brush, a bit of water dampened rag, a steady hand and a LOT of careful patience. One side of the plant holder has HERBS and the other SEEDS. I used up quite a bit of Gail's card stock trying out other sizes, words, eraser lines and a few stock shapes. Quite a learning curve to make your own stencils. Great job! I think you did a fantastic job Joy and your smile and creations always brighten my day! Pinned and shared! Thanks for your continued support! Thanks again Joy for sharing this at the Say G'day party! Pinned and look forward to seeing you on Saturday! Visiting from #whatsonthelist, love your stencils. Thanks for a great tutorial on stenciling. Very lovely results. These turned out sooo good! Fabulous stencils and I admire your sticking with it, well worth the effort. 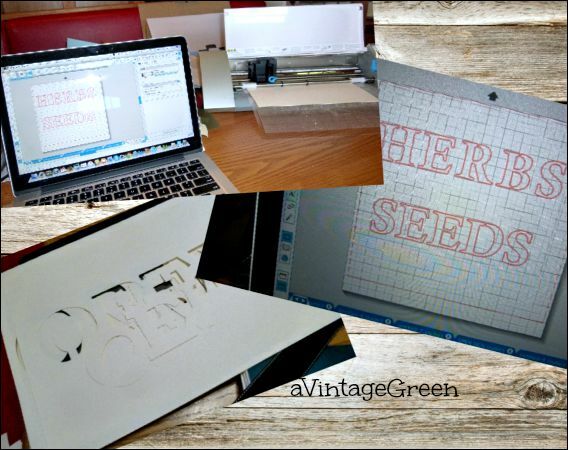 Joy, it's a great way to cut stencils. I don't have a cameo, but my daughter has a Cricket and cuts them the same way. I love how you put different words on each side! Thanks for sharing with SYC. Your first try looks like you're a pro, dear Joy :) It turned out beautifully. Thanks for sharing with Roses of Inspiration. Hugs to you! Joy, that plant holder is so lovely. I have a Cameo and I've been tempted to throw it out of the window so many times! I think I would need to take some classes from you, I can't make mine cut some "thick" material but yours seems quite thick too. Any tip?